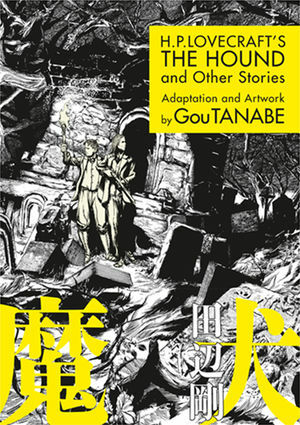 Three stories from one of the foundational pulp horror writers are turned into creepy comics by Gou Tanabe, providing atmospheric horror that touches on the start of the Mythos. 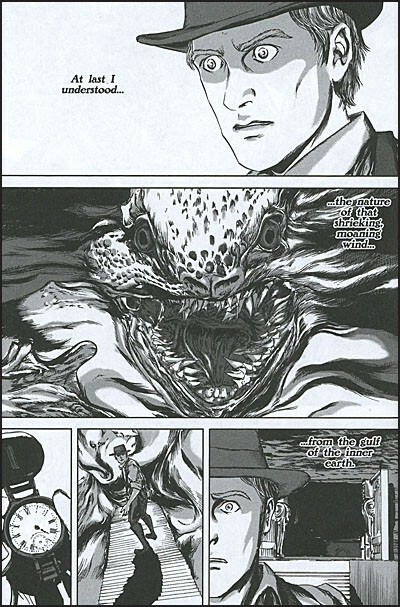 Featuring a crazed German sub commander who dives the deep waters of madness, two grave robbers who encounter secrets men were not meant to know, and an explorer's trip to a city older than time, Tanabe captures the best of Lovecraft's thematic brilliance while leaving the more problematic pieces behind in this great series of adaptations. The linework here is spectacular! The eyes pierce through the reader's skull, daring you to turn the page or be filled with nightmares forever. 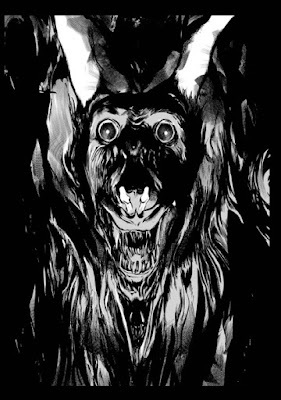 This hound has snarling teeth, but the inks here, which feel as though they were violently applied, scream primal figure--their irregularity adding to the feeling of unease, even as the way in which the blacks of the piece keep you confused as to whether they confine the size of the beast--or conceal it. It's amazing work that continues page after page. 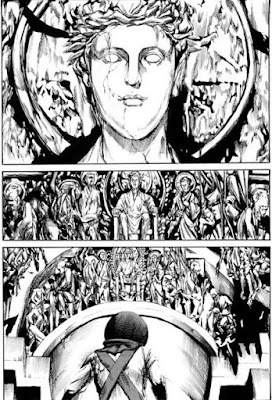 In the opening story, The Temple, Tanabe makes us feel uncomfortable and claustrophobic, just like the sailors who know they are going to die, by creating a series of tight panels, page in and page out, with anywhere between 8 and 10 small scenes tucked into each page. It both enables him to keep the dialog between the characters going and makes you feel the tension of being stuck in a disabled sub whose commander won't surrender. When Lovecraft moves the story into an underwater structure that shouldn't exist, the large spreads open us up, just like the main character, to behold the wonder and mystery--and madness of what we behold. Here's another example of that amazing linework, different from the hound above, yet showing the same kind of thought and care--how can something this nearly pristine be living under waters of the deep? It's positively George Perez-like in its detail. I can't think of a better way to describe it. And again, the haunting, unearthly eyes come out in the figure on the throne. I'm so incredibly impressed by Tanabe's work, and it looks like this is the only thing available currently in English, which is clearly a plot by the Elder Gods to torment me. The middle story, The Hound, was the weakest of the three stories, not so much for the art as for the fact that it doesn't stray far from the "grave robbing has a price" trope. It's got a cameo by a Necronomicon, but the main feature is a small icon that leads to the death of the dandies. Tanabe does a great job with shadows here, and switching the faces of the main characters from being eager and gleeful to terrified. The pacing lags a bit, but I blame Lovecraft for dragging out the denouncement too far. Page after page of The Nameless city is our "hero" learning that what he's stumbled into spells nothing but doom for anyone who meets the creatures depicted on the walls. 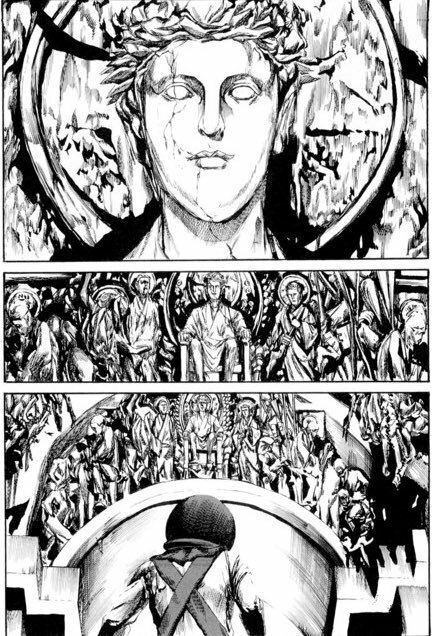 It's a mix of terrified reaction shots with gruesome drawings, and by the end, as he tries to escape, we return to the claustrophobic panels just in time for a freedom--that doesn't truly exist. As I said above, I'm an easy mark for Lovecraft related work, but this is some of the best I've seen. I understand that Tanabe has done more adaptations, and I hope we get more in English soon. Regardless, anyone who loves cosmic horror and/or Lovecraft needs to pick up this collection and enjoy the images--which may soon become part of their nightmares.